Preheat oven to 350°F. In a medium bowl, combine crushed graham crackers, butter and coconut flakes, if using, and stir until well combined. Pat down graham cracker mixture evenly into the bottom and sides of a 9-inch round pie plate. Bake crust in oven until golden brown, about 12-15 minutes. In the meantime, prepare the filling. Whisk together condensed milk and egg yolks in a large bowl. Pour in lime juice and whisk until ingredients are well combined. Set aside (mixture will thicken as it rests). Allow pie crust to cool to slightly warm before pouring the filling into the crust, about 10 minutes. Make sure filling is spread evenly in the pie plate and against the edges of the crust. Bake 15-17 minutes. Remove from oven and cool completely on a cooling rack before placing in fridge to chill. Allow to chill in fridge for at least 4 hours to set before serving. Top pie with halved lime slices and whipped heavy cream, if desired. To me, Key Lime Pie is the epitome of the peak of summer. Nearly every July when I was growing up, my parents would take us kids to the Florida Keys for vacation. Not a trip went by when we didn’t stop by the local pie shop to grab a slice (or two, or three) of its authentic Key lime pie. It was tart and tangy (and pale yellow, indicating the use of true Key limes) with a sweet, buttery graham cracker crust and a dollop of cool whipped cream on top. I looked forward to the pie almost more than the beach! 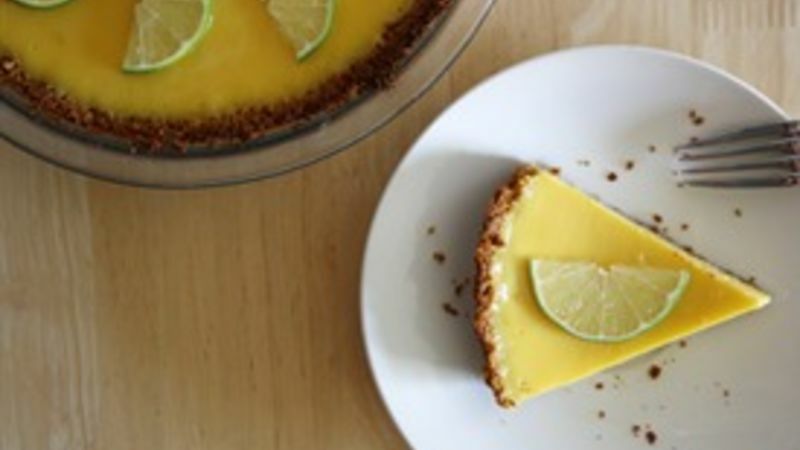 Key Lime Pie remains one of my favorite pies to eat and bake. Not only does it bring back fond memories of summer vacations, but I’ve always been a fan of tart pies, and this one certainly fits the bill. Plus, it’s one of the easiest pies to make – the crust and filling are done and ready to chill in less than half an hour. During these busy summer months, it’s quite convenient to get dessert done in that kind of record time. Though I kept this version of my recipe fairly simple and straightforward, sometimes I like to play around with the ingredients to give it extra flavor. I did add coconut flakes to the crust for extra sweetness and texture (they toast while in the oven, too, for even more flavor dimension), but if you’re not a fan of coconut, leave it out.